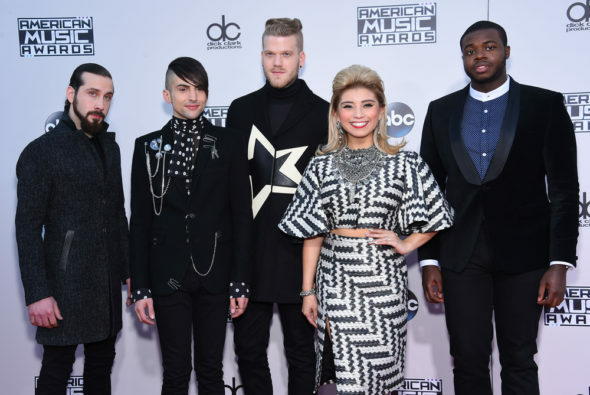 Pentatonix is getting their own NBC Holiday Special. The group won the third season of The Sing-Off in 2011. NBC quietly cancelled that a cappella singing competition after its fifth season was down-graded to a two-hour special. A Pentatonix Christmas Special premieres on NBC, Wednesday, December 14, 2016 at 8:00pm ET/PT. The Peacock Network has announced Reba McEntire and Kelly Clarkson as guest stars and promises more surprises are on the way. Check out this NBC press release, for more. UNIVERSAL CITY, Calif. — Nov. 2, 2016 — Grammy Award-winning and multi-platinum recording artist Pentatonix is poised to host their first-ever holiday network special on Wednesday, Dec. 14 at 8 p.m. ET/PT on NBC. What do you think? Were you a fan of The Sing-Off TV series? Will you tune in for A Pentatonix Christmas Special? Let us know, below. More about: A Pentatonix Christmas Special, A Pentatonix Christmas Special: canceled or renewed?, The Sing-Off, The Sing-Off: canceled or renewed? The Sing Off: Music Series Cancelled by NBC? Season Six? Yes, I plan to watch as well. I’ve followed this group since the SING-OFF, and have attended 2 of their concerts. Total fan will ABSOLUTELY be watching!!! I absolutely plan to watch!! I also have it on record so I can enjoy it multiple times! !